My thesis research led me back downtown this morning. It was so quiet and peaceful, despite being a weekday. My meeting didn't last that long so I had a few moments to sketch. I took the opportunity to complete the EDM challenge of drawing a landmark...in this case the Jefferson-Pilot Building. 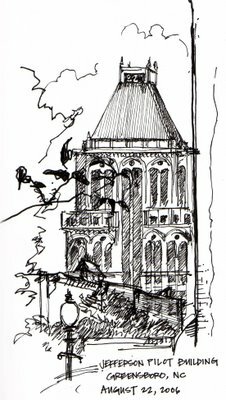 I wondered as I drew the building what it must have been like to construct it. It is such a tedious task just getting the details right on paper. I can't imagine in brick and mortar. Suzanne, I'm in awe! Your sketches are very good. Free, easy and beautiful. I like that. Wish I could do that to. I'm still to controlled and careful. That's what is left after a year of drawing portraits as realistic as possible .. Still have hope, though. Your sketches are really good. I love the style and I am inspired by them....keep it up! Really nice. Are those crows in the tree in the foreground? The building looks a little spooky so some big blackbirds would look just right. 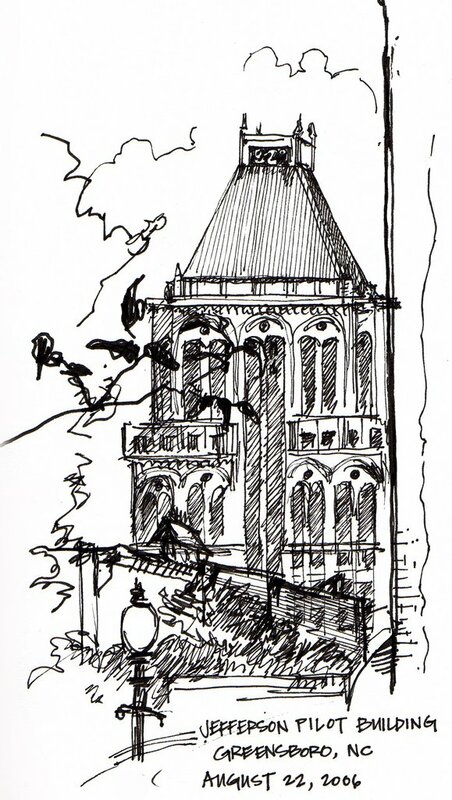 Drawing buildings is clearly your speciality if you can do that as a quick sketch! You have a wonderful style. I was looking at all your drawings yesterday and then ran out of time to comment :)! Good job. I love seeing what you are doing and I'm glad that you post often. You are inspirational to me also.